Bison is a general-purpose parser generator that converts an annotated context-free grammar into an LALR(1) or GLR parser for that grammar. Once you are proficient with Bison, you can use it to develop a wide range of language parsers. 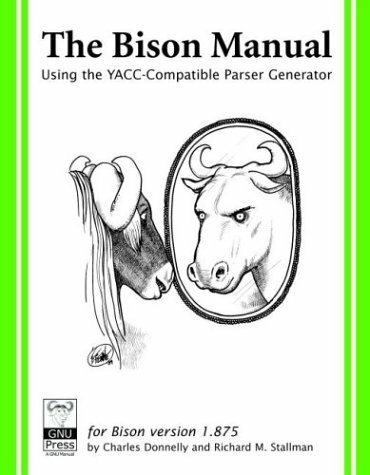 You need to be fluent in C or C++ programming in order to use Bison or to understand this manual. We will build a small functional language called Fun, complete with a parser, type inference, datatypes, pattern matching, desugaring, typeclasses, higher-kinded types, monadic IO, arbitrary-rank polymorphism, records, Core language, etc. This is an introductory level text for compiler design courses, that emphasizes problem solving skills. The concepts are clearly presented with sampler problems and diagrams to illustrate the concepts. The text also covers lex and yacc.